Tofu Puff, with its fluffy, light golden brown appearance, is a favourite in dishes like stuffed tofu, salad and curry. 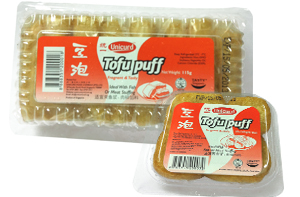 UnicurdTM Tofu Puff has a rich beany taste as it is made from 100% premium Soya beans*. Unicurd™ Springy Silken Tofu is halal certified and qualify for "Healthier choice" and "Tasty Singapore"” labeling. All Unicurd™ Tofu range is made in Singapore to ensure daily freshness are delivered to our customers.